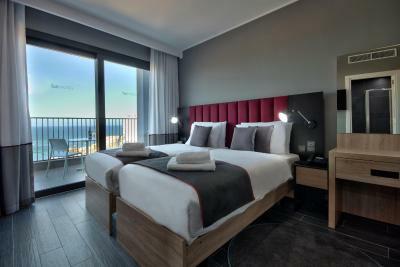 Lock in a great price for be.HOTEL – rated 8.4 by recent guests! Room was OK (missed the balcony though), comfortable and clean. I also liked the morning expresso's prepared by Donato or his colleagues and the warm welcoming of restorant manager. Breakfast buffet was more than adequate. The staff packed us a breakfast bag that we could take at 3:30 in the morning (we had a very early flight). The location is very good; it's within a mall so shops are at your disposal (if shopping is your thing), it's a night out location full of restaurants and bars. St Julian's is a nice place to stay in, not too crowded with tourists (end of March). Hotel is located near the bay and our room had a nice sea view. The stop for the tour buses (hop on and off Malta sightseeing, Gozo tours, City sightseeing) is just by the bay, some few meters from the hotel. We had a marvelous stay in Malta and this hotel added the perfect touch to a relaxing visit. Thank you to the super efficient and very welcoming staff. Size of the room, location, parking deal. Breakfast was also alright. Staff worked hard to make up for check-in fiasco (see comments in “didn’t like” category) from 1st night and upgraded our room to a family suite the remainder of our stay. Parking only 3€ each day (or every time you leave, so I recommend staying parked once you’re in). The location is superb and the unit we got had a full kitchen, perfect for infants. We were there during a massive storm and the staff pulled through with food and cleaning. Amazing group! Clean, nice staff. Breakfast with a fair selection of hot and cold food. Central location in St. Julian, quite some shops in building. Spacious room. Nice Shower. Fast internet. Taxi stand right in front of building. I absolutely loved everything about this hotel ! In the center of the mall . It was paradise for me . be.HOTEL This rating is a reflection of how the property compares to the industry standard when it comes to price, facilities and services available. It's based on a self-evaluation by the property. Use this rating to help choose your stay! One of our top picks in St. Julianʼs.Just 650 feet from the sandy beach of St George’s Bay, the 4-star be.HOTEL is located within the Baystreet Tourist Complex. It features a large panoramic pool on its 11th-floor rooftop terrace. In this modern and colorful hotel, you can book a massage at the nearby beauty salon. Set in 2 wings, air-conditioned rooms come with an interactive HD TV and private bathroom with a hairdryer and free toiletries. All rooms have free WiFi. Inside the complex you will find a huge number of shops, a family entertainment center, a bowling alley and a large range of restaurants. Pubs, bars and clubs are all located close by be.HOTEL, allowing you to make the most of Paceville's lively nightlife. Malta International Airport is 5.6 mi away. This is our guests' favorite part of St. Julianʼs, according to independent reviews. This property is also rated for the best value in St. Julianʼs! Guests are getting more for their money when compared to other properties in this city. When would you like to stay at be.HOTEL? Air-conditioned room with an interactive HDTV, a mini-bar and a private bathroom with a hairdryer. Free WiFi is also available. This suite offers air conditioning, 2 bedrooms and 1 bathroom. Free WiFi is also available. This air-conditioned unit offers a kitchenette, free WiFi and interactive HDTV. This twin room has a flat-screen TV, tile/marble floor and air conditioning. Free WiFi is also available. This suite features a balcony, bathrobe and tile/marble floor. Free WiFi is also available. This twin/double room features a balcony, tea/coffee maker and tile/marble floor. This suite has a tile/marble floor, flat-screen TV and air conditioning. House Rules be.HOTEL takes special requests – add in the next step! be.HOTEL accepts these cards and reserves the right to temporarily hold an amount prior to arrival. Please note that the rooftop pool is open from May until October, weather permitting. Please note that for group reservations of 3 rooms or more, different policies may apply. 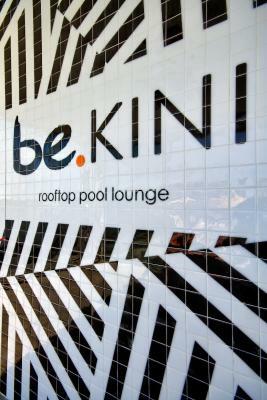 The rooftop bar 'be.kini' I think it's called, was not open. We stayed from Tues-Sunday and never seen anyone in it although we did share a lift with a staff member with a trolley of beverages to stock it. The location was great, the housekeeping staff were amazing. Check-in was a bit of a fiasco. Having read somewhere check-in was from 1pm, the hotel said 3pm and the reality was later than that. It was also in a really, really noisy part of the island. Clubs going until early hours is one thing, workman drilling outside the hotel before 8am another. I also found that some restaurant staff were a little off hand. The pool was closed, which was disappointing. And there was a whole bizarre thing with towels (started with 4 got to as many as 7 and ended with 2). This was a perfectly decent hotel with helpful reception staff. The breakfast is as you expect and a good range of food was on offer. The room was clean and kept tidy throughout my stay. Noisy, but hey, like I mentioned it’s in the middle of the party district. Great breakfast selection and if you enjoy nightlife, the location is unbeatable. The hotel's entrance is in the shopping centre,a bit complicated to access to hotel's floors,not indoor pool and other facility,for massage and swimming pool you need to go to another hotel near by. I guess the guest service could be more polite and proactive and by that I mean reply to all the doubts on the mail and not partially and ironically in the end says that is glad to help and still leave pending doubts and this happened more than once. I mean, as a guest I shouldn't insist so to have a reply of any sort. If you have trouble with noise this is a no go. Since it close to bars and nightlife even staying on a high floor you will still hear music until late night. Really enjoyed the breakfast (lots of kind of food and always fresh); room was clean and tidy; really close to bars, restaurants, foodmarkets and the sea. Great rooftop and scenery from there. Transportation is just around the corner. The hotel is really central and inside a shopping mall. The cleaning service on the room was with very low standard. Room attendant just took the rubbish out, she forgot about towels and toiletries. Left the room with out any attention to detail. After request for the bathrobe and slippers, porter has deliver after 5hours. Also I saw him walking on the corridor with a mobile phone, but he forgot about the slippers. Coffee tray on the first day was full of various kinds of milk, tea and sugar, next days only decaffee coffee and green tea. Disapointing, when you pay the same money for the each day.